New Delhi, Sep 20 : A batch of students from Nagaland, studying in various Delhi-based universities, decided they wanted to get to know the other Nagas in the city better. And while they were at it, they figured they'd try to help their people back home in Nagaland as well. 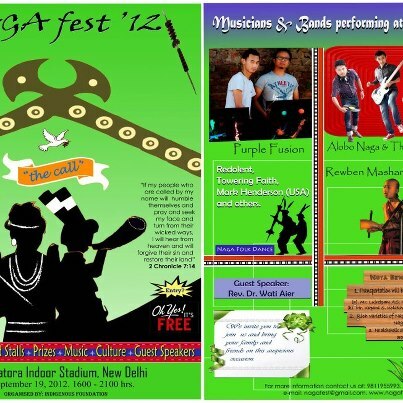 NagaFest, set to take place at Talkatora Stadium on September 19, was conceived in January. "Few of us thought, why not?" says Nokho Nekhya, convenor of the organizing committee of the fest which will include music performances, food, clothes and tattoo stalls. "There are 20,000 nagas staying in Delhi. But we never get an opportunity to come together. Also, the ones coming here are the cream of the Naga society. It is our responsibility to put other before ourselves," says Nekhya, 23, a student till very recently. NagaFest will not end with a fest. The 20-member organizing committee and the 100-odd volunteers it has drawn are going to stay on for other projects. On in the works is a conference on entrepreneurship end of this year or beginning of the next. Encouraging entrepreneurship among the "indigenous people" of Nagaland is one of the group's long-term plans. "Most people - about 70% of them - in the state depend on the government. We want them to train them to be self-sustained. The conference will be about small-scale industries in rural areas as there are many who have studied by haven't got jobs," says Nekhya. The group has the support of American organization, Indigenous Foundation. It is paying for the venue of the September fest where about 3,000 people are expected. There are performances by Rewben Mashangva , a folk musician influenced by Bob Dylan and Bob Marley and whose own music is described as "Naga folk blues." Another band playing tradition Naga music with a dash of western elements is Purple Fusion. The show is being run mainly by students. Volunteers were drawn at smaller functions organized by the Naga Students' Union, Delhi. With the union, explains, Nyekha, there are "tribal unions." "There are 35 Naga students bodies in the city. We'd go to events organized by them and ask people to contribute. We told them we have to everything without expecting anything in return," she says. Their efforts have a spiritual aspect to it too. Many responded to the call and the organizers have their programmes and logos designed for free. They met a few days ago and "one gentleman" contributed money so the group could have dinner together.